Technology can make outsiders of us all…lack of technical knowledge can strand us outside of certain platforms of communication, whilst other technologies can form marginal communities that internalise socially alienated positions. Babel was an installation of 3D printed imaginary towers assembled from an online open call to a global community of sculptors, visionary artists, architects, engineers, 3D designers and model makers. We are in search of contemporary, modern and ancient towers; industrial or religious; fantastical or utilitarian; brutalist or gothic…from air traffic control towers to bell towers to tower blocks and sky scrapers. 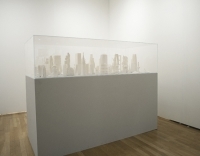 The resulting works were installed and displayed together creating a phantasmic city installed in the project space at the Outsider Art Fair in New York. Conceived and curated by Leah Gordon.